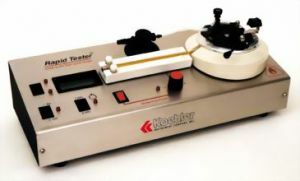 Product Description The Koehler K16500 rapid flash closed cup flash point tester verifies the flash point or the sustained burning qualities of small samples in the range of -30°C to +300°C. This Rapid Tester provides rapid determinations of flash point or sustained burning qualities by using a small sample. A flash/no flash test result is achieved in one minute for flash points below 212°F (100°C) with a 2mL sample. Ideally suited for quality assurance and environmental compliance testing as well as actual flashpoint for paints, fragrances, hydrocarbons and other liquids. Two models are offered: the Closed Cup Model is for routine flash point tests in the range from -30 to +300°C (-22 to +572°F); the Open-Cup Model is for sustained burning tests in the range from ambient to 212°F (100°C). Open cup models are used for determining sustained burning qualities characteristics of mixtures of flammable and nonflammable liquids or liquids with widely different flash points when assessing flammability characteristics. Features convenient semi-automatic operation for flash/no flash tests. Set the test temperature on the digital display and inject a 2mL or 4mL sample into the sample cup. The tester quickly stabilizes itself at the desired value, permitting the test flame to be applied and the result to be observed by the operator. Unit also performs conventional determinations of actual flash temperature by the small scale closed tester method. Conforms to the specifications of: ASTM D3278, D3828, D4206; IP 303; ISO 3679, ISO 3680, ISO 9038; DOT CFR 49-173.115; IATA. Includes automatic temperature control with °C/°F selector switch, syringe, electronic timer, integral NIST traceable thermometer, and an external hose adapter valve for connection to a customer-supplied fuel cylinder or other fuel source. Includes aluminum Test Cup/Brass Lid & Shutter. Also available with stainless Steel Test Cup/Lid & Shutter at a slight additional cost.